Our business cards are made from premium quality 350gsm card which is silk-coated on both sides to give a super-smooth matt-satin finish for a premium look and great feel. Your business cards will feature the same font styles and colours as your vehicle signs, giving your business the professional look it deserves. Choose the same colours and font styles as on your signs. Simple drag-and-drop design with 'snap to centre'. Professionally checked prior to production and tweaked by us to make perfect. Receive your business cards in just 4-5 working days. 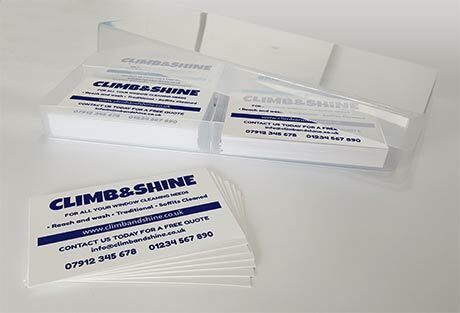 Your business cards will be supplied in a sturdy plastic storage case, great for keeping them in top condition. Printed in high resolution onto top quality silk coated stock, your business cards are sure to convey a quailty image for your company. With our simple to use designer and free delivery on all orders, getting your business cards couldn't be easier. Why settle for fonts that "look roughly right" or colours that "are kind of similar"? The font selection here is exactly the same as on our sign products, and our print colour matching means the colours will look right too (our orange and yellow vinyls are so vibrant that these are matched in tone, with less brightness). Complete the look of your branding with our business cards to present the best possible image to your potential customers. It couldn't be easier to re-order your business cards when the time comes. Simply enter your four-character re-order code in the box below to call up your design and click the quantity required to check out. Easy! Need alterations? Please contact us and we'll get your design just the way you want it. Please include your re-order code in your message along with your desired changes. Need a larger quantity? You can choose multiples at the checkout stage.